Monitor your house and office, your child and pets and so on at anytime and anywhere Motion DetectionReal-time Alarm	It supports motion detection and can auto-capture dynamic images. After images comparing it would transfer the alarm message to your smartphone or tablet if it judged that your properties were invaded. The WiFi version Clever Dog is only suitble to WIFI condition. It builts in microphone and loudspeaker . It supports full-duplex speech, real-time video, and automatic infrared night vision. The resolution of camera is 720*576. 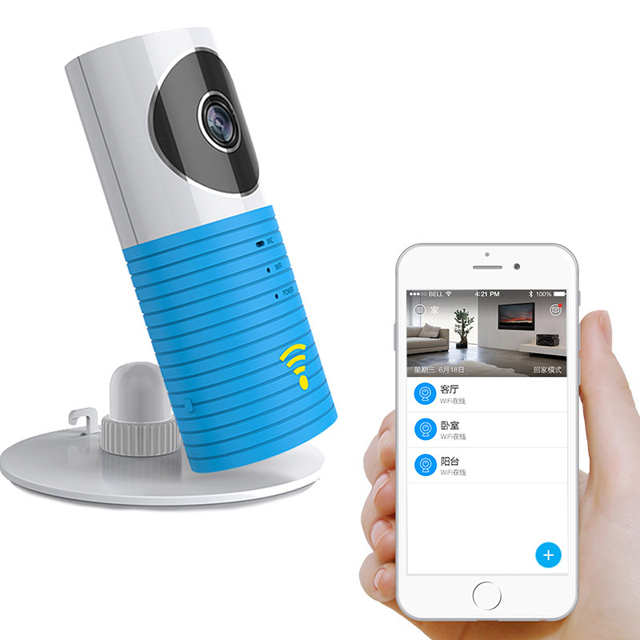 Real-time Video, Watching at Will	Supporting various intelligent terminals, it makes you watch live video anytime, anywhere. Full-duplex Speech, Enhancing Family Relationship	It supports full-duplex speech, and makes you communicate with your family while watching the video, then enhances the relationship of your family. Motion Detection, Real-time Alarm	It supports motion detection and auto-capture dynamic images. After images comparing it would transfer the alarm message to your smartphone or tablet if it judged that your properties were invaded. Intelligent videoing, Quick Reviewing	It supports auto-recording, and can quickly locate pictures by timeline. Sharing Your Exciting Moment to your friends	It supports video picture capture, by which you can share the exciting moment to your friends and family. P2P Services, Secure and Convenient	Deploying P2P technology, it can establish direct connection between the smart phone and the camera. To ensure the data security and prevent it from data leak aging, all video pictures are stored locally, instead of saving in the server. Sharing Your ExcitingMoment to your friends	By which you can share the exciting moment to your friends and family.